Our first impression as we entered Burrata at the Old Biscuit Mill in Woodstock, Cape Town, was of a stylish interior in the manner of the restaurants in New York City's Meat Packing District. 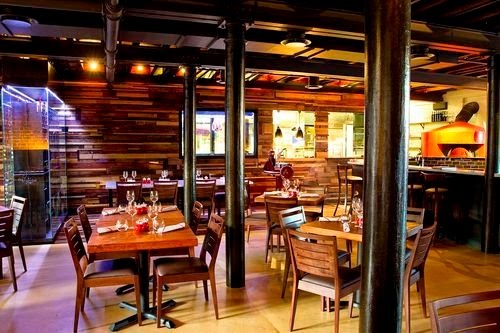 Wood, steel and glass and bare face brick walls combine to create an urban industrial feel. But it is the splendidly bold red pizza oven presiding majestically over proceedings from a corner of the restaurant, which immediately catches one's eye. This is a special pizza oven. It is different from most other pizza ovens and we would soon find out all about it. Burrata is a fresh Italian cheese made from Mozzarella and cream. The outer shell is Mozzarella while the inside is a combination of Mozzarella and cream, or sometimes a mixture of butter and sugar. Best served fresh at room temperature, it is the epitome of buttery deliciousness. Burrata means 'buttered' in Italian. It was lunch time and the restaurant was buzzy. A charming waiter brought us menus and chilled filtered water in a wine bottle. I thought that was really cool. There are no floor- sweeping linen table cloths. Instead, there are shiny wooden tables with plump red cruets in the centre and lovely large white cotton napkins with embroidered red borders waiting to be unfurled. Round stubby water glasses await the chilled water. The effect is minimal and stylish. We didn't know what to do first. Study the menu, take in the surroundings or gaze at the wonderful looking food on the tables nearby. The menu is divided into sections of 'Starters', 'Pasta', 'Main Course', 'Pizza' and 'Dessert'. We were introduced to the pleasures of the menu by our most knowledgeable and unflappable waiter. 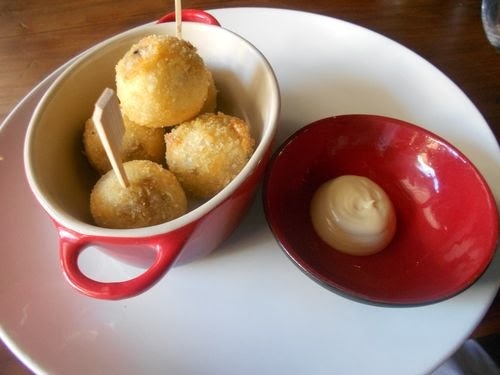 First he told us that the 'additions' that day would be 'Arancini served with aioli' which I chose as a starter. He told us with pride that any extra item that the chef creates on the day is an 'addition' not a 'special' as everything is special. We were enraptured. The Starters include 'Norwegian Salmon Tartare, preserved with lemon mayonnaise and pancetta', or you could try 'Salad of Grilled Zucchini, Marinated Aubergine, roasted yellow peppers and goat Pecorino'. I loved the sound of a salad of 'Fried Brussels Sprouts, beetroot, nectarines and parsley' and was sorely tempted by the 'Burrata Cheese, basil, cherry tomatoes and an olive oil cracker'. There are many more fascinating items on the starter menu. My attention was grabbed by the sight of a large platter being borne aloft past our table. This is the ’Antipasti for Two: a selection of local cured meats, cheese and preserves served with pizza bread. It is so luscious looking and certainly a promise for another time. The Pasta section is most interesting. Nothing is quite what it seems. 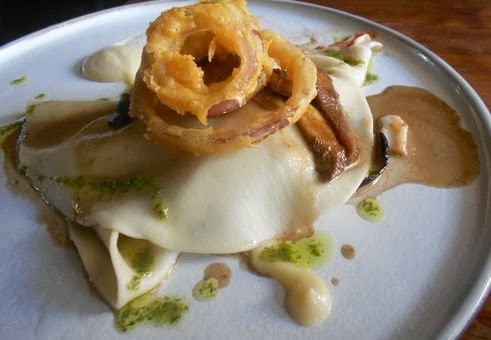 I discovered this on another visit when I ordered the "Lasagne" of mushroom, white onion puree, smoked aubergine and parsley oil'. This is no baked cheesy, creamy 'thing'. It is sheer bliss. Beautifully home-made lasagne sheets are interspersed with mushrooms and smoked aubergine and delicately attended by the white onion puree and parsley oil. Everything could be tasted as if it stood alone. I will have to use enormous will power not to order it every time we dine at Burrata. I have been told that the 'Gnocchi with gorgonzola cream, broccolini, toasted walnuts and pancetta' are fluffily magnificent. Try 'Tortellini of buffalo yogurt, roasted pumpkin seeds and blackened onions' or 'Tagliatelle Nero, west coast mussels and prosecco crema' or perhaps, 'Pappardelle, slow cooked short rib, roasted red pepper ragu and crispy onion'. All the pasta is homemade. Actually, everything from the start of the meal to dessert is homemade. There are six Main Courses listed on the menu. 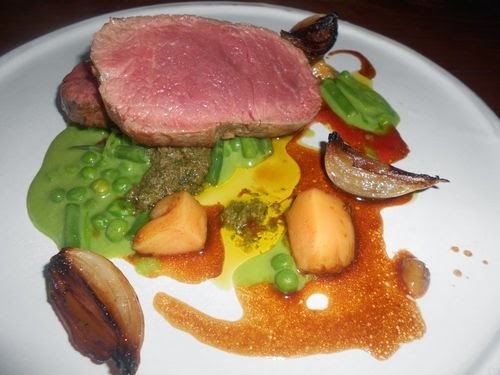 On the day, Eugene chose 'Grass fed beef Sirloin with Roasted Baby Onions, peas, bone marrow and salsa verde'. 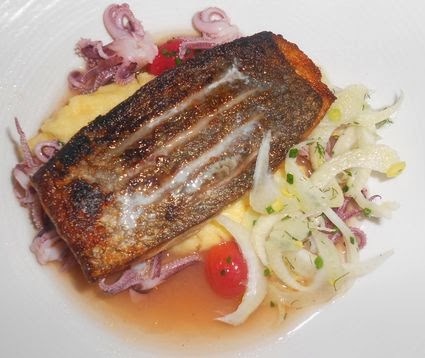 I ordered 'Pan Fried line fish with Squid tentacle broth, soft polenta, confit tomatoes and fennel'. Doesn't that sound amazing? The line fish on the day was Cape Salmon. Other titillations are 'Risotto with crispy pork, granny smith apple and currant vinaigrette', 'Braised Beef Belly, marinated artichokes and barley risotto with porcini, pine nut brittle' - imagine that, pine nut brittle! And to complete the list, 'Sous vide pork neck, ragout of cannellini beans, chorizo and sweetcorn and honey turnips'. And now the Pizza section. There are 12 choices of Neapolitan style pizzas. The legend on the menu states that "Burrata strives to create the best Neapolitan style pizza. This style of pizza has a puffy, flame blackened crust with a light crispness. We use only the best quality ingredients including flour and tomatoes exclusively imported from Italy. 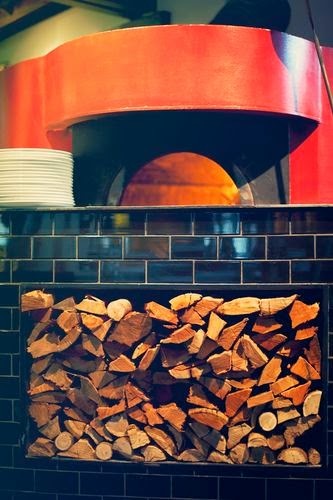 Our Italian oven cooks our pizzas at 480c in less than 90 seconds." And most importantly, no rolling pins are used in making the dough. The dough must be kneaded and then stretched by hand. There is a choice of a 'tomato base' or a 'pizza bianca.' Not all of them have a Mozzarella base, which is great if dairy is a problem. Eugene has adored the 'di mare' which consists of prawns, squid, garlic with coriander and chili aioli'. Vegetarians have a wonderful choice of the Marinara, the Margherita, the Burrata and the Mozza. Try The Capperi, 'white anchovy, capers and chili oil', or the Deire 'truffle spread, mozzarella, mushroom and prosciutto' or the Salsiccia 'home-made chili fennel sausage, caramelised onion, smoked mozzarella and spinach'. All delicious and exciting. The Dessert section presents 4 mouth-watering choices. There is a wonderful sounding 'Chocolate Mousse, coffee, brandy and mascarpone ice cream'; 'Vanilla Panna Cotta, hazelnut daquoise, berries and a plum sorbet', 'Lemon Curd Gelato, amaretto roasted peaches with chocolate soil' and a 'Pizza oven baked pastry, granadilla, poached pears, toasted pistachio and cream cheese'. Oh my! I defy you to resist any one of these bewitching temptations. Burrata has a full liquor licence, with a wine list that displays our patron's knowledge and passion for the grape. There are carefully constructed categories with full details of vintages and vineyards, chosen with thought and consideration to satisfy peoples' tastes. Wines by the glass are interesting and different from the usual slew of offerings to which one has become so accustomed. 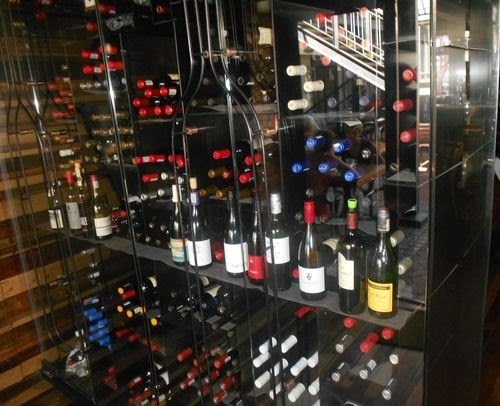 A stunning see-through glass wine cellar in one corner of the room gives an idea of the variety of wines that await one's pleasure. Our food arrived. As a starter, I had ordered 'Arancini with Aioli'. We had decided to share the starter and combine the tastes with pizza bread. The delicately prepared deep-fried risotto balls were filled with mozzarella, beef flank, roasted red pepper and smoked papino. These delicious chubby offerings were speared with bamboo skewers to make for easy dipping in the aioli. A taste sensation. Eugene was saving himself for his main course of beef sirloin, so he had only one and loved it. I was delighted, I had four! We did share the pizza bread though, a wonderful creation of Neapolitan pizza base with Parmesan cheese and oregano topping. Light and divine. Then our mains. Eugene cut tenderly into his beautifully prepared pan-fried Sirloin beef, medium rare, just as he had requested. Tender and succulent, it oozed with flavour. Salsa Verde, bone marrow, roasted baby onions and peas completed this wonderful dish. The mouthful that I was allowed was sheer joy. My pan-fried line-fish was an eye opener. I had been almost reluctant to order it as I usually find Cape Salmon to be a bit dry and frankly boring. But, was I in for a treat! This Cape Salmon was gorgeously moist, oozing with the flavour of the squid tentacle broth and the gentle flavours of confit tomatoes and fennel which melded beautifully with the soft polenta. It is hardly possible to go any further without telling you about the owners and creators of Burrata, Neil Grant and Barry Engelbrecht. Barry Engelbrecht is retired and combines his love of wine, food and Neapolitan pizzas with a wide knowledge of the industry. He travels the world in search of gastronomic perfection. Neil Grant is the hands-on part of the combination. He spent seven years working and studying in San Francisco where he qualified as a sommelier at the 'Court for Master Sommeliers'. On his return to South Africa at the end of 2006, he and master chef, David Higgs, established the Number One Award-winning Restaurant at Rust en Vrede. Now it is Burrata, which was launched on the 2nd March 2012 that is the source of his passion and pursuit of perfection. Neil Grant and his team have kept up their winning ways as Burrata has just been voted by Eat Out as the 'Best Italian Restaurant for 2013', having already won 'The Birra Moretti Best Emerging Italian Restaurant Award for 2012' Wow, this is some provenance! Now, the 3rd part of the team - Chef Annemarie Steenkamp, who has been part of the Burrata project since the beginning. 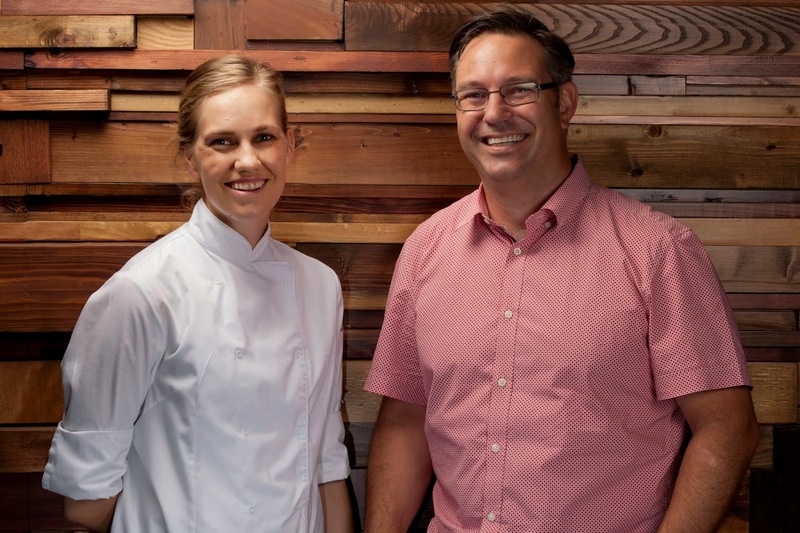 After travelling abroad and studying, she honed her skills as the executive sous chef under the incredibly talented prize-winning chef extraordinaire, Margot Janse at Le Quartier Francais in Franschoek. There are certainly a lot of prize-winning people and places in this story! Now Annemarie is Head Chef at Burrata. She, Neil and Barry worked out a magic formula for the spell that they would cast over future diners at Burrata. She holds sway in the pristine and beautifully run kitchen that she helped to set up. Here she turns out the most delicious and wonderful looking food with an eye and instinct for flavours that complements Neil's dynamic wine choices. Diners have a marvellous view of the kitchen through large glass windows and can watch the lady magician at work. Pizzas are sold all day from 12 noon to 10h00 while the main kitchen is open from 12h00 to 15h00 and 18h00 to 22h00. You can enjoy the pizzas at Burrata or order takeaways. Mondays are open from 18h00 - 22h00 from September to April only. Booking is essential at night and over weekends.